Dubai, love it or hate it! The most famous city in the UAE is full of spectacular skyscrapers, luxurious hotels and enormous shopping malls. The reason for all these tourist attractions is simple: they are running out of oil. Tourism is their alternative plan to keep the country rich. Due to that, it is full of innovation and spectacular architecture. 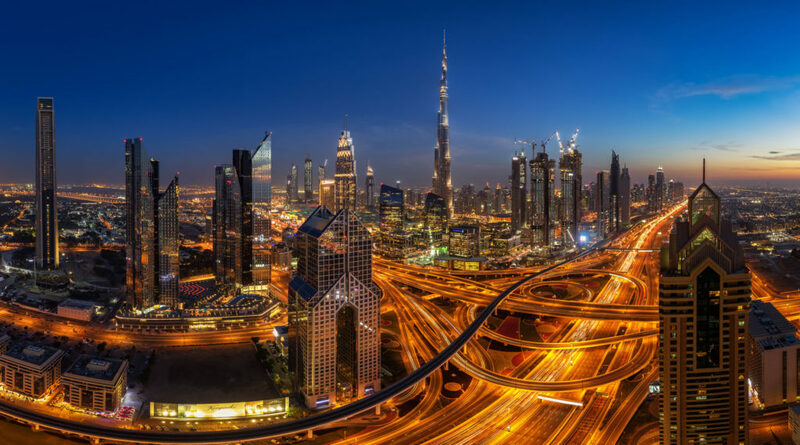 A dream for every travel photographer who is looking for the perfect skyline shot in Dubai! My last stop on my Asia Trip was the first destination where I was running for just one particular picture. I wanted a perfect skyline shot of downtown Dubai from above. The problem? It is tough to get a permission to shoot from a rooftop and the weather conditions in Dubai were really bad during my stay. Nevertheless, I waited patiently and got lucky on my last day! The weather in Dubai was really bad at my first days. Several sandstorms blew up so much sand, that you could barely see the whole skyline. The sky was white and grey without any structure. Due to the bad conditions, I explored the city and tried to find great photo-spots for some other architecture shots. 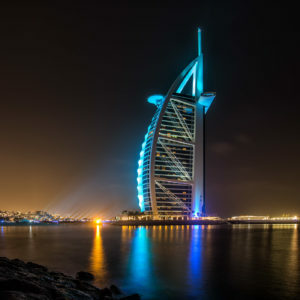 One of these places was the popular Burj al Arab Hotel next to Jumeirah Beach. A business man who stayed at the same Airbnb went with me to the 360 Degree Bar, where I got a clear shot of the seven star hotel. It is the only place were you get that close to the building. Luckily, the dust was not that visible during this night and I got a clean shot. The rest of the time was frustrating regarding travel photography. The conditions stayed bad and I had to spend most of my time at my apartment in the Marina area. I used the time to ask several hotels for a shooting permission. At least I wanted one chance for a perfect skyline shot. After several attempts I got a permission at the Shangri La Hotel which is located next to the Sheikh Zayed Road and offers a perfect view over downtown Dubai. The weather forecast predicted a clear sky for my last day and I took my chance and reserved a spot on the hotel roof for the morning hours. Normally, the sunrise is the best time for a perfect skyline shot in Dubai. The reason for that is the clean morning air which offers much more visibility. Still, I didn’t feel satisfied with this shot. It was a great sunrise and a wonderful panorama of downtown Dubai, but it was not good enough for my own personal claim. The communication manager gave me another permission and offered me another chance in the evening. The blue hour came in perfectly. I got a clear sky and the city started to light up right on time. Five panorama shots were just enough to capture the whole beauty of downtown. I knew that this shot was perfect, my perfect skyline shot in Dubai. The patience was worth it. Four days for one outstanding shot. Surprise! 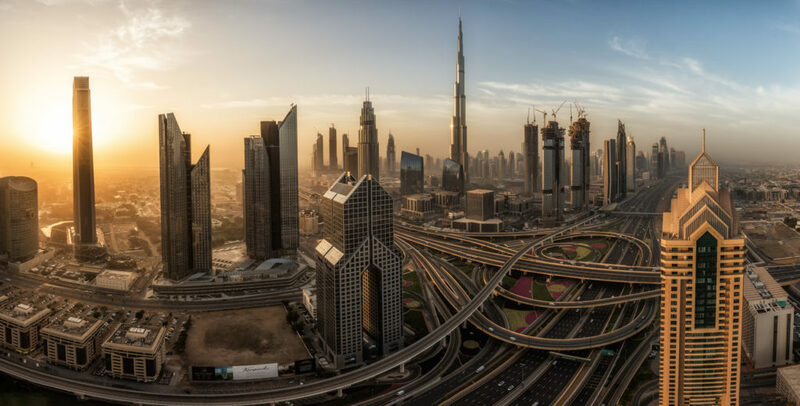 Two weeks after my trip I got a message, that my skyline shot in Dubai got rewarded as Fstoppers Photo of the Day. I never expected such a great honor to happen. They featured my picture at their homepage and Instagram with more than 300.000 follower. It’s a great feeling to take exactly the photo you imagined and get rewarded for it afterwards. At some point passion combined with hard work always pays off! Absolutely stunning photos! I’m glad for you that the dust storm died down enough for you to capture such amazing images ! Respect for this great piece of art. This shot from downtown Dubai is so beautiful. The skyline of Dubai is so impressive. Thanks for sharing all these great images with us! Thank you for sharing your beautiful story and some thoughts of Dubai, very detailed and well written! I would like to commend the Author of this Blog for sharing us an interesting idea. Keep it up a good job!! Dubai, oh Dubai. I have great memories of this city with its amazing skyline. Thanks for taking me back with your great photographs. Awesome photography. I must say that you’ve done an amazing job with this. Also, I needed to thank you for this fantastic read!! I am professional Travel Photographer currently living in Leipzig, Germany. Feel free to discover my blog articles about my recent trips and photography projects.